Nicaragua is a country in Central America. In the 1970s it was ruled by a right-wing dictator named Somoza, who had close ties with the United States. Left-wing rebels organized a guerilla army to fight Somoza. The rebels called themselves Sandinistas, after a guerilla leader named Cesar Augusto Sandino, who had fought against the American occupation of Nicaragua during the 1920s and 1930s. 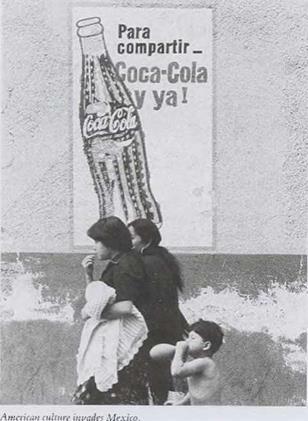 The Sandinistas were supported by peasants, workers, priests and many business people. In 1979 they drove Somoza from the country and set up a new government. They promised the people of Nicaragua land reform, social justice and democratic government. 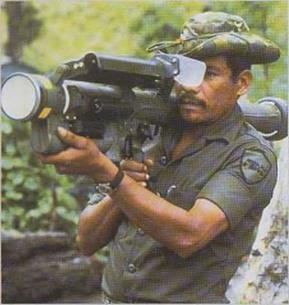 A Nicaraguan Contra rebel with Redeye missile supplied by the U. S.
A poster in Managua, Nicaragua proclaims that Reagan is on his way out, hut the revolution is here to stay. At first the United States government welcomed the Sandinistas. President Carter offered them economic aid. But when Ronald Reagan became President in 1981 this policy changed. Many Americans criticized Reagan’s policies. They warned that his enmity was forcing the Sandinistas into the arms of the Soviet Union. Other Americans supported the President. They bcheved that the safety of the United States depended on stopp ng Sandinista ideas from spreading to other nearby countries. In February 1990 an election was held in Nicara­gua. When the Sandinistas lost, they handed over power to a new government whose leaders were more acceptable to the United States and hopes for peace increased. As soon as the war ended fresh calls of “Yankee, go home” were heard. To try to reduce anti-Amet ican feeling, in 1945 the United States took the lead in setting up the Organization of American States (OAS). The idea of the OAS was to encourage the countries of Latin America to cooperate with one another, and with the United States, as partners. One of its aims was to improve living standards. But hardship and hunger continued to be widespread in Latin America. In most countries there, extremes of poverty for the many and wealth for the few existed side by side. Oppressive governments controlled by the rich and backed by soldiers did little to improve the lives of the people. “Mucra Nixon, Mucra Nixon!”-Death to Nixon! A barricade blocked the road. The car rocked wildly as the chanting mob tried to overturn it. Rocks and iron bars thudded against its roof and shattered its windows. Inside the car Richard Nixon, Vice President of the United States, was in great danger. It was May 13, 1958, in Caracas, the capital of Venezuela. Nixon was visiting the city as part of a goodwill tour of Latin America. But he found only hatred on the streets of Caracas. Nixon’s life was saved when a truck forced a way through the barricade and his car was able to accelerate away. When news of the attack reached the United States the American people were shocked and angry. But it made them realize how much some Latin Americans hated and resented their country. Latin America is the name given to the mainly Spanish-speaking countries which lie to the south of the United States. Ever since the early nineteenth century the United States has taken a special interest in what happens in these countries. They arc its closest neighbors and so it is important to the safety of the United States to make sure that no foreign enemies gain influence in them. In the past this has often meant that the rulers of these Latin American countries have been little more than American puppets. Their agriculture and industry have frequently been American-controlled, too. A classic example was Cuba. Up to the 1950s its railroads, banks, electricity industry and many of its biggest farms were all American-owned. Roosevelt ordered home the American soldiers and officials who had been running the affairs of Latin American countries at one time or another for much of the past thirty years. Nicaragua, for example, had been occupied by American troops from 1912 to 1933. He also gave up the United States’ claim to interfere in Panama and Cuba whenever it wanted. But many Latin Americans were not convinced by Roosevelt’s talk about being a good neighbor. True, the American troops had gone home. But the rulers who took over when the soldiers left – the Somoza family, who held power in Nicaragua from 1937 to 1979, for example-usually did what the Americans expected of them. і he Second World War brought better times for Latin America. All the raw materials that it could produce-copper, tin, oil and countless others-were used by the wartime factories of the United States. The result was more money and more jobs-but also even more American control. Songs of protest have played a part in American life for many years. These have been songs about the concerns of farmers, miners, cowboys, union members. All have had a common purpose-to express and to relieve people’s feelings on subjects that are important to them. Their writers and performers have sometimes hoped that the songs might even help to change people’s attitudes. Oh, the history books tell it. Oh the country was young With God on its side. N ixon worked out a plan to achieve this. He called it the “Victnamization” of the war. He set out to strengthen the South Vietnamese army to make it seem strong enough to defend South Vietnam without help. This gave him an excuse to start withdrawing American fighting men from Vietnam. 1973. By March 1973, the last American soldiers had left Vietnam. But the real end of the Vietnam War came in May 1975. As frightened Vietnamese supporters of the Americans scrambled for the last places on rescue helicopters, victorious communist tanks rolled into Saigon, the capital city of South Vietnam. The communists marked their victory by given Saigon a new name. They called it Ho Chi Minh City. In Korea, twenty years earlier, the Americans had claimed that they had made containment work. In Vietnam they knew, and so did everyone else, that they had failed. Kent State University is in Ohio. 3n 1970, after riots there in protest against the war in Vietnam, any further demonstrations were banned. When a group of about 1,000 students defied the ban, they were fired on by soldiers. A tcn-second burst of rifle fire killed four students and wounded another ten. I In – Victimm. Memorial, Waih ingioi i D. C.
Otic of the landmarks of Washington, D. C., is a massive building of white marble. It is a memorial to Abraham Lincoln. Close by, almost hidden in a hollow in the ground, stands another memorial. This memorial is not to one man but to many. It is a long wall of polished black marble and on it are carved many thousands of names. !he names arc those of young Americans who died in the Vietnam War. Vietnam is in Southeast Asia. Once it was ruled by France. But in 1954 the French were driven out by the soldiers of a communist leader named Flo Chi Minh. Like Korea, Vietnam was then divided in two. Comnmnists ruled the North and non-com піші і sts the South. The next step was supposed to be the election of one government for the whole country. But the election never took place—mainly because the government of South Vietnam feared that Ho Chi Minh and his communists would win. I Io Chi Minh set out to unite Vietnam by war. He ordered sabotage and terrorism against South Vietnam. As part of their worldwide plan to contain communism, the Americans had already helped the French againsr I lo. Now they sent weapons and advisers to the government of South Vietnam. Containment was especially important to the Americans in Vietnam. This was because of an idea that President Eisenhower called the “domino theory.” The domino theory went like this: Asia has a lot of unsettled countries. If one of them —Vietnam, say— fell under communist rule, others would follow. They would be knocked over one by one, like a line of falling dominoes. Americans were especially afraid that communist China might try to take control in Southeast Asia as the Soviet Union had done in eastern Europe. So, in the 1950s and early 1960s, first President Eisenhower and then President Kennedy poured American money and weapons into South Vietnam, Kennedy sent soldiers, too-not to fight, themselves, but to advise and train the South Vietnamese forces. By the early 1960s, however, it was dear that the government of South Vietnam was losing the war. 1-Го Chi Minh had a guerilla army of 100,000 men fighting in South Vietnam by then. These guerillas were called the Vietcong. Many were communists from the North who had marched into the South along secret jungle trails. By 1965 the Vietcong controlled large areas of South Vietnam. The country’s American-backed government was dose to collapse. President Lyndon B. Johnson. Johnson faced a difficult choice. I le could leave Vietnam and let the communists take over, or he could send in American soldiers to try to stop them. Johnson was too worried about the domino theory —and too proud-to make the first choice. He had already ordered American aircraft to bomb railways and bridges in North Vietnam. Now he sent in American soldiers. By 1968 over 500,000 were fighting in South Vietnam. 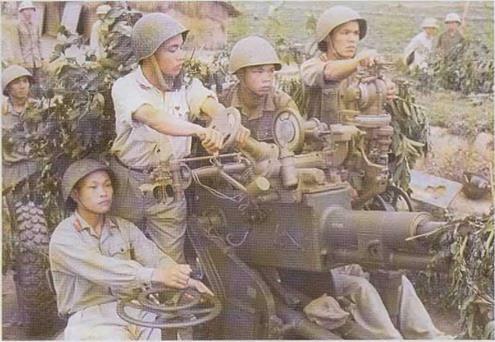 The Russians and the Chinese sent more weapons and supplies to Ho Chi Minh. Thousands more of his communist troops marched south to do battle with the Americans. The Vietnam War was one of ambushes and sudden attacks. After an attack the Vietcong would melt away in the jungle, or turn into peaceful villagers. Ordinary villagers helped and protected the Vietcong. Sometimes they did this out of fear, sometimes out of sympathy. “The people are the water, our armies arc the fish,” one Vietcong leader said. American fighting men grew angry and frustrated. They sprayed vast areas of countryside with deadly chemicals to destroy the Vietcong’s supply trails. They burned down villages which were suspected of sheltering Vietcong soldiers. But the fighting went on. It continued even when Johnson stepped up or “escalated” the war by bombing cities in North Vietnam to try to force the communists to make peace. Film reports of the suffering in Vietnam were shown all over the world on television. For the first time in history people far away from any fighting were able to see in their own homes the horror and cruelty of modern war. Millions began to believe that the Americans were cruel and bullying monsters. husbands in Vietnam. By the end of the 1960s many Americans were sick and ashamed of the killing and the destruction. “L. B.J., L. B.j., how many kids have you killed today?” shouted angry demonstrators. President Johnson saw that by sending American soldiers to fight in Vietnam he had led the United States into a trap. The war was destroying his country’s good name in the world and setting its people against one another, in 1968 lie stopped the bombing of North Vietnam and started to look for ways of making peace. In 1969 Richard Nixon was elected to replace Johnson as President. Likcjohnson, he wanted to end the Vietnam War. But he, too, wanted to do so w’ithout the Americans looking as if they had been beaten.